Alex laces up his skates in Russia! ALEX AND THE GHOSTS was selected in competition for the Multivision International Festival of Animated Arts. ALEX AND THE GHOSTS won Best Editing in the Animation category at the FirstGlance Film Festival Philadelphia! ALEX AND THE GHOSTS was invited to participate in a special tour: the Festival-in-a-Van Tour from the ViewFinders International Film Festival for Youth, a school tour in the Maritime provinces. Thank you for allowing Alex to travel! Alex will get a tan in Miami! ALEX AND THE GHOSTS was selected for the Miami Short Film Festival ! ALEX AND THE GHOSTS received two special invitations from two new festivals: the Reel Fun Film Festival, a film festival for youth in Calgary Alberta, and the Danville International Children’s Film Festival in California. Two new awards to add to Alex’s little collection! Alex won Best Animation Film from the Action/Cut Short Film Competition (http://www.actioncut.com/sfc/2010winners.htm) and the award for Achievement in Story from AniMazing Spotlight (http://www.animazspot.com/)! We are all very proud! Go to our Screenings page for all the details. One more festival in California! More good news from our fans down in California… ALEX AND THE GHOSTS has been selected for the Sacramento Film & Music Festival! To our great surprise, ALEX AND THE GHOSTS won the Audience Choice Silver Medal for the original score by Blair Thomson at the Park City Film Music Festival. Another festival selection for ALEX AND THE GHOSTS… the HollyShorts Film Festival in Hollywood! Alex has fans all the way in L.A…. Alex’s first award! ALEX AND THE GHOSTS won first prize of its category at the Reno Film Festival. We are all so proud! More good news for Alex… ALEX AND THE GHOSTS has been chosen as one of 3 finalists in its category at the 10th Reno Film Festival! The Ghosts are here, for the Montreal Canadiens and for Alex! Alex will be back in Montreal! ALEX AND THE GHOSTS will be back in Montreal in July for the Fantasia International Film Festival 2010! One of the most recognized genre festivals in the world, even cherished by big names like Quentin Tarantino! An unexpected selection for Alex, now playing with the big boys! Come visit us again soon for scheduling details. Hope to see you at Fantasia! 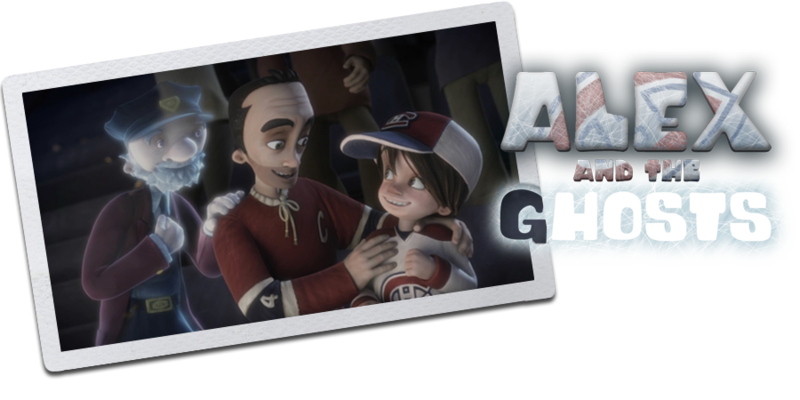 Latest news from the festival circuit… ALEX AND THE GHOSTS will be presented at the Folie-Ô-Skop Animation Film Festival in Abitibi-Témiscamingue! For the schedule information click on our Screenings tab. … or right next door. ALEX AND THE GHOSTS will be in competition at the Cannes Independent Film Festival! It’s the cooler little brother of big Cannes for emerging filmmakers. Wish us luck! Impressively professional in all categories. Most fun canadian hockey film since 'The Sweater'. Congratulations. To me, the film is almost perfect. We are in an animation world but it works like a very cinematographic work. Very professional. I love it! Love the energy of the timing, the nice emotional story, also funny. The animation is beautiful. The 3D animation is wonderful, not heavy as it often is... The sound track helps, It’s easy to understand. It must be a great success in Canada.... Congratulations! Combining the mystique of the legendary Montreal Canadiens hockey team and the hopes and ice-bound dreams of a little boy, this animated film is sure to delight hockey fans of all ages.